Assigned status Up to Date on July 10, 2017. Peters’ anomaly is one disease in a constellation of diseases that causes corneal opacity due to dysgenesis of the anterior segment during development. Peters’ anomaly can cause devastating corneal opacity in an infant leading to severe amblyopia. Diagnosis involves careful anterior segment exam as well as testing for other systemic findings which would suggest Peters’ Plus syndrome. Treatment involves a corneal transplant which is often complicated due to the young age of the affected. Peters’ anomaly is one disease in a constellation of diseases that causes corneal opacity due to anterior segment dysgenesis (ASD) during development. It has been known over the years as primary mesodermal dysgenesis of the cornea, congenital anterior synechiae, posterior keratoconus and anterior chamber cleavage syndrome. Peters’ anomaly affects the iris, corneal endothelium and Descemet’s membrane leading to Peters’ type I. Peters’ type II in addition will have lens abnormalities and tend to be bilateral. 60% of those with Peters’ anomaly are bilateral. In both forms, opacification of the cornea leads to an amblyogenic effect on a developing infant. Peters’ plus syndrome includes short disproportionate stature, developmental delay, dysmorphic facial features, cardiac, genito-urinary, and central nervous system malformation. These systemic findings are seen in up to 60% of patients. Peters’ is also associated with many other ocular pathologies including glaucoma, sclerocornea, corectopia, iris hypoplasia, cataract, ICE syndrome, aniridia, iris coloboma, persistent fetal vasculature and microcornea. Premature infants are at highest risk for development of ACD including Peters’ anomaly. In addition, a deficiency of heparan sulfate can lead to abnormal neural crest development in utero. Fetal alcohol syndrome has been reported as a cause of Peters’. Histologically, Peters’ type I has an absence of Descemet’s membrane and endothelium in the area of the corneal opacity with underlying iridocorneal synechiae. The overlying stroma, Bowman’s layer and epithelium are rarely involved. The opacification often involves the central cornea, however, can affect the entire cornea. Peters’ type II will have lens abnormalities that can be seen histologically. The American Academy of Ophthalmology's Pathology Atlas contains a virtual microscopy image of Peters' Anomaly. 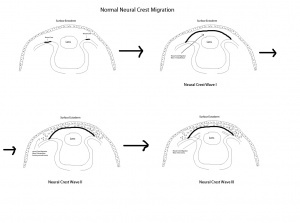 Normal corneal development depends on neural crest migration which occurs in 3 distinctive waves during embryogenesis to produce the structures of the anterior chamber. This typically occurs during the 7th week of gestation. The first wave involves the formation the corneal endothelium as the neural crest cells migrate between the surface ectoderm and the lens. The second waveforms form peripheral neural crest cells migrating between the newly formed corneal endothelium and surface ectoderm to form the keratocytes that will lead to formation of corneal stroma. The final wave involves formation of the iris stroma. Any disruption of neural crest migration or separation can lead to an anterior segment dysgenesis. Peters’ anomaly is an in utero abnormality of multiple gene loci that cause anterior segment dysgenesis. No primary prevention has been described for this disorder. Peters’ anomaly is diagnosis by anterior segment exam in infants found to have corneal opacification present at birth. B-scan ultrasound or ultrasound biomicroscopy can be used to examine the anatomic relationship between the lens, iris and cornea. Genetic testing of one of the aforementioned genes can help to confirm Peter’s anomaly, but is classically diagnosis clinically. Patients are often seen initially by the pediatrician and found to have an abnormal red reflex with a corneal leukoma. It is on the differential for congenital corneal opacifications. Anterior segment exam reveals an opacification on the cornea with underlying loss of endothelium and Descemet’s membrane with overlying corneal edema. 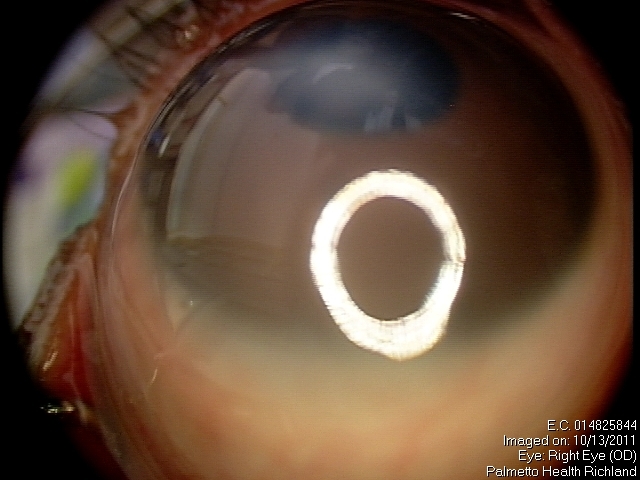 Iris strands can often been seen attached to the area of opacified cornea. These strands may or may not be still attached to the body of the iris. Corectopia is often present in addition to a shallow anterior chamber. In addition, in type II Peters’ lens is typically adherent or closely abutting the cornea. These figures show the stromal opacity within the cornea in a 1 week old newborn child. Note the extremely shallow anterior chamber. The most common sign is a corneal opacification seen at birth. Decreased vision by way of blockage of the central visual axis due to the corneal opacification will lead to deprivation amblyopia. In addition, patient may suffer from glaucoma due to likely malformation of the angle structures as well as shallow anterior chamber. Peters’ is diagnosed by clinical features seen on anterior segment exam. Genetic testing can be done to characterize other potential systemic involvement. Genetic testing for aforementioned genes and chromosomes. Peters’ anomaly is part of a spectrum of ASD which have similar pathways of development. These include: Axenfeld-Rieger anomaly and syndrome, iridocorneal endothelial syndrome, posterior polymorphous dystrophy, congenital hereditary endothelial dystrophy, and congenital hereditary stromal dystrophy. Treatments for Peters’ anomaly aim at clearing the central visual axis to allow for visual maturation. Full thickness penetrating keratoplasty is the current standard of care. Iridoplasty for reformation of iris and cataract extraction for those with lens involvement. Medical therapy would include monitoring of glaucoma as intraocular pressure are often elevated in Peters’ patients due to the dysgenesis of anterior segment structures including angle structures. Patients with Peters’ anomaly should be considered for a corneal transplant for clearing of the central visual axis as soon as medical possible. Due to the systemic problems that can accompany Peters’ anomaly including heart and central nervous system defects, consult to genetics, cardiology and neurosurgery should be considered. Close follow up for management of glaucoma with frequent examination under anesthesia. 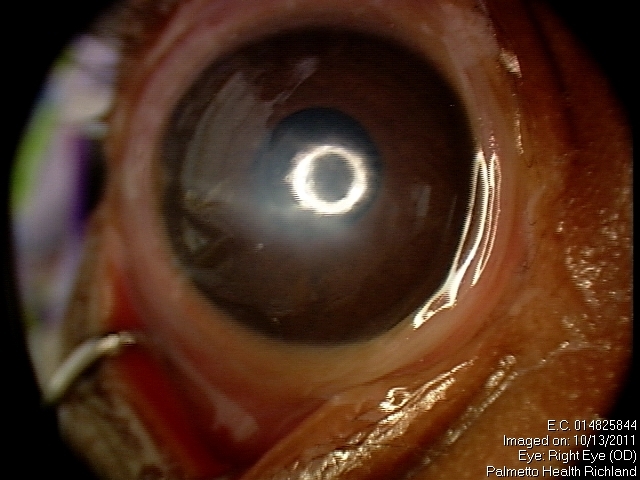 Penetrating keratoplasty is indicated in Peters’ for infants. 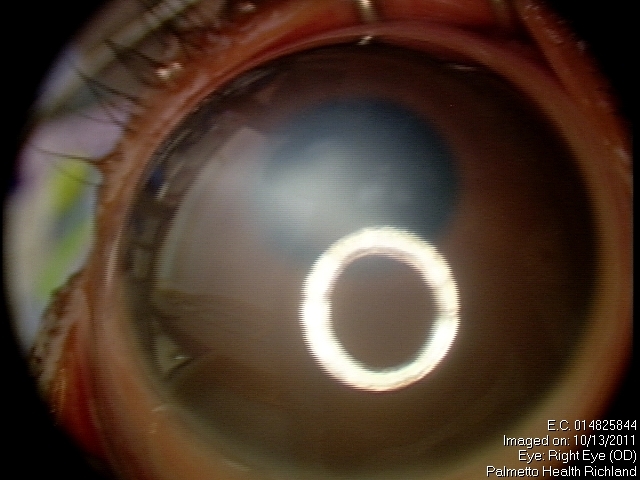 Cataract extraction with limited anterior vitrectomy in the setting of an opacified lens and corneal lenticular adhesion. As with any corneal graft, frequent follow-up is required to help prevent graft failure. In children, follow-up with frequent exam under anesthesia is warranted to check pressure as these infants will be on long term immunosuppression with topical steroids and cyclosporine to avoid rejection. Complete suture removal within the first 2-3 months may be necessary as younger patients tend to have a more robust response with corneal neovascularization along the suture tracts. Treatment for spectacle correction and amblyopia treatment should be initiated as soon as possible. Graft failure, infection, and steroid induced glaucoma. Prognosis for maintaining clear graft after 2 years is a low 22% as reported in a study by Rao et al5. Due to the young age of the patients, it is believed that immunologic rejection is the most common cause of graft failure. Graft failure rates have been reported to increase when combined with lensectomy and vitrectomy. In addition, those with preexisting glaucoma have a poorer visual prognosis. Overall visual prognosis is poor after corneal graft with one study finding that less than one-third of eyes with Peters’ have visual acuity better than 20/400. In that same study, predictors of poor visual outcome included stromal vessels and large corneal grafts >8mm. American Academy of Ophthalmology. Peters anomaly Practicing Ophthalmologists Learning System, 2017 - 2019 San Francisco: American Academy of Ophthalmology, 2017. ↑ Kaufman HE, Barron BA, McDonald MB. The Cornea. 2nd edition. Butterworth-Heinemann, 1997. ↑ Aliferis K, Marsal C, Pelletier V, Doray B, Weiss MM, Tops CM, Speeg-Schatz C, Lesnik SA, Dollfus H. A novel nonsense B3GALTL mutation confirms Peters plus syndrome in a patient with multiple malformations and Peters anomaly. Ophthalmic Genet. 2010 Dec;31(4):205-8. ↑ Shimizu R, Saito R, Hoshino K, Ogawa K, Negishi T, Nishimura J, Mitsui N, Osawa M, Ohashi H. Severe Peters Plus syndrome-like phenotype with anterior eye staphyloma and hypoplastic left heart syndrome:proposal of a new syndrome. Congenit Anom (Kyoto). 2010 Sep;50(3):197-9. Epub 2010 Jun 24. Rao KV, Fernandes M, Gangopadhyay N, Vemuganti GK, Krishnaiah S, Sangwan VS. Outcome of penetrating keratoplasty for Peters anomaly. Cornea. 2008 Aug;27(7):749-53. Yang LL, Lambert SR, Drews-Botsch C, Stulting RD. Long-term visual outcome of penetrating keratoplasty in infants and children with Peters anomaly. J AAPOS. 2009 Apr;13(2):175-80. Zaidman GW, Flanagan JK, Furey CC. Long-term visual prognosis in children after corneal transplant surgery for Peters anomaly type I. Am J Ophthalmol. 2007 Jul;144(1):104-108. Najjar DM, Christiansen SP, Bothun ED, Summers CG. Strabismus and amblyopia in bilateral Peters anomaly. J AAPOS. 2006 Jun;10(3):193-7. Vincent A, Billingsley G, Priston M, Glaser T, Oliver E, Walter M, Ritch R, Levin A, Heon E. Further support of the role of CYP1B1 in patients with Peters anomaly. Mol Vis. 2006 May 16;12:506-10. Neilan E, Pikman Y, Kimonis VE. Peters anomaly in association with multiple midline anomalies and a familial chromosome 4 inversion. Ophthalmic Genet. 2006 Jun;27(2):63-5. Mataftsi A, Islam L, Kelberman D, Sowden JC, Nischal KK. Chromosome abnormalities and the genetics of congenital corneal opacification. Mol Vis. 2011;17:1624-40. Epub 2011 Jun 17. Sutphin JE, Dana MR, Florakis GJ, Hammersmith K, Reidy JJ, Lopatynsky M. External Disease and Cornea Basic and clinical science course. American Academy of Ophthalmology LEO, 2009. This page was last modified on February 14, 2019, at 14:42. This page has been accessed 141,481 times.